A few months ago, Oleg Deripaska was riding high. The Russian billionaire took his sprawling industrial holding company, EN+, public in London in late 2017. Weeks later the Kremlin insider was the talk of Davos, where he reportedly threw a lavish reception headlined by the pop singer Enrique Iglesias. Now, the party is well and truly over. Deripaska was hit last week with tough new US sanctions that target him, and businesses that he owns or controls — including the aluminum producer Rusal. Under the sanctions, Americans are prohibited from doing business with the companies, and people of other nationalities could face sanctions themselves if they facilitate transactions for the firms. The sanctions will make it exceedingly difficult for Rusal to do business in dollars. "The US Treasury just decided to take him out," Anders Åslund, a senior fellow at the Atlantic Council, said of Deripaska. "He will be wiped out by this." Rusal did not respond to a request for comment. The company said in a statement last week that the sanctions were likely to "be materially adverse" to its "business and prospects." It said it would continue to abide by all applicable laws and regulations. Rusal produces 7% of the world's aluminum, according to the US Treasury. International buyers, business partners and commodity exchanges are scrambling to sever ties with the company. Some cuts are deeper than others. EN+ and Rusal will both be removed from key stock market indexes. Two directors have resigned from the board of Rusal, while Moody's Investors Service and Fitch Ratings have both withdrawn credit ratings for the company. More problematic for Rusal is a decision by the London Metal Exchange, the industry's key market, to stop accepting Rusal aluminum unless the owner can show that doing so is legal under the sanctions. The move will prevent owners of sanctioned aluminum from dumping it on the exchange. But it also underscores the hurdles Rusal faces in continuing to conduct business in many international markets. Global commodities trader Glencore (GLCNF), which owns shares in Rusal and buys aluminum from the company, said in a statement that it was "committed to complying with all applicable sanctions in its business and is taking all necessary measures in order to mitigate any risks." Rusal's share price has plunged 56% since the sanctions were announced. 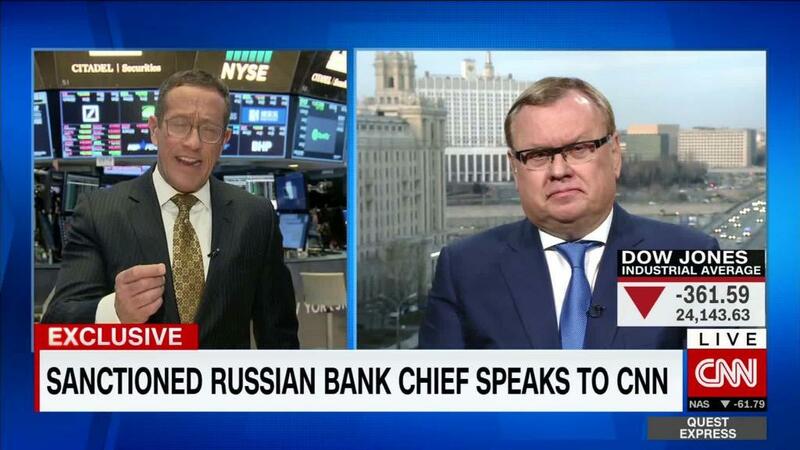 "I think this is the end of Rusal," said Åslund, a former Swedish diplomat who later served as an economic adviser to the Russian government. Glencore also said that it would not proceed with plans to swap its stake in Rusal for shares in EN+. Deripaska, a physicist by training, has earned a reputation as a survivor. He emerged from the chaotic scramble for assets following the collapse of the Soviet Union with a massive fortune, which Forbes estimated at $28 billion in 2008. Soon after, a sharp decline in commodities prices during the financial crisis caused his net worth to plummet. Asked by the Financial Times in 2010 how close he came to going out of business, Deripaska said: "Very close." He recovered his footing, and billions of his fortune, in the years that followed. Related: Did Russia make this ship disappear? More recently, Deripaska has become a subject of political intrigue in the United States because he has a longstanding relationship with Russian President Vladimir Putin. He is also a former business associate of Trump campaign chairman Paul Manafort, who has been indicted as part of an investigation by US special counsel Robert Mueller. Manafort has pleaded not guilty to all charges against him. In announcing the new sanctions, the US Treasury said that Deripaska had "said that he does not separate himself from the Russian state." Deripaska has described the U.S sanctions as "groundless, ridiculous and absurd." The oligarch may now need help from Putin's government in order to prevent the collapse of Rusal. Russian finance minister Anton Siluanov said earlier this week that the government was willing to provide a financial lifeline to Rusal. According to state media, he said that stable operations were needed to protect the company's 170,000 workers. Denis Manturov, the minister for industry and trade, said that plans had already been drawn up. "As soon as Rusal asks for support, we will immediately try to provide it," he said Thursday, according to state news agency RIA Novosti. "Support means a specific process, specific measures to be taken."